As any estate agent will tell you www.rightmove.co.uk leads the way in marketing your property - and MovingLocation probably provide the cheapest route to the UK's No.1 property website. Your property will be fully marketed in their High Street offices, where they offer buyers and sellers 21st Century solutions to get you moving. Grant Kangley, the proprietor, has been an Independent Estate Agent, Property Finder, Landlord and Developer throughout Sheffield & Chesterfield since the 1980's and can help you sell fast anywhere in the world, whilst saving you £'thousands in fees. They offer an Internet Estate Agency Service from just £295 (£195 in advance and £100 on completion). You will have your property featured on Right Move.co.uk and other UK leading property websites. For more details on how they can help you to sell your property fast, move and save, please call Chris at TheMovingLocation on 01246 29 2121. STILL NOT SURE? Ask Property Plus, the Estate Agency BROKER on 0114 250 0050 this is a FREE SERVICE. They can also arrange your FREE valuations and negotiate your best sales option at the lowest fees available. 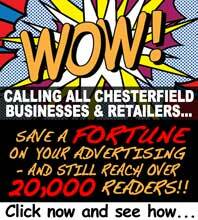 Remember to mention the Chesterfield Post to get your FREE VALUATION when you discuss your property sale.